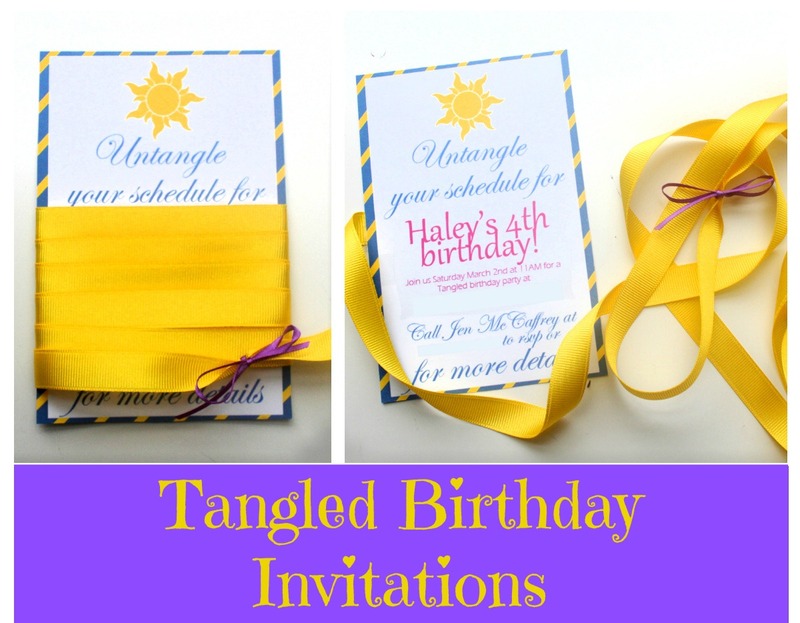 Yet again, I couldn't keep myself away from making birthday invites, even after the torture I went through to make Connor's Knight Party invites. I had SO much fun planning Haley's Tangled birthday party that I didn't need to force myself to be creative (which happens a lot more than you might think :) With all my crazy DIY-ing, I initially considered buying invites; but then a thought came to me: "Why not make themed invites that require the recipients to "untangle" Rapunzel's hair to get all the party details?" You know I couldn't buy invites from a store with inspiration like that. 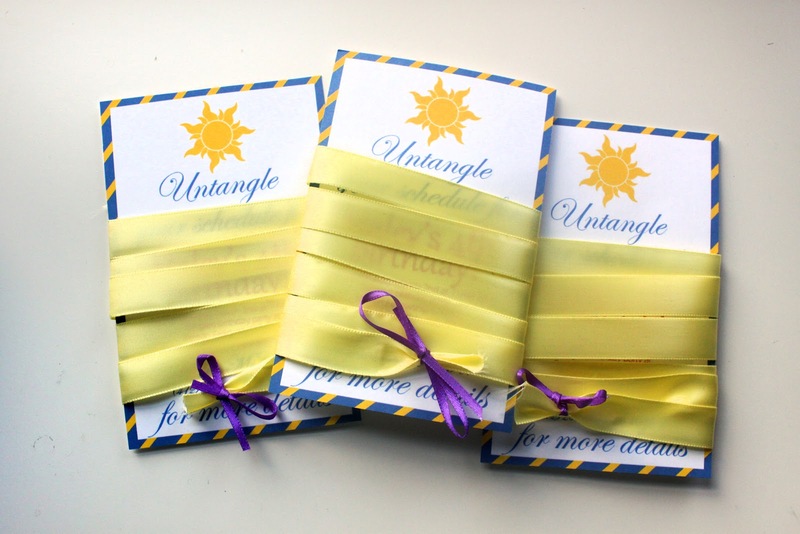 I designed the cards in Photoshop and made them in such a way that the card reads "Untangle for more details" while the ribbon "hair" is wrapped around it so the reader understands that they have to unwrap the ribbon for all the party details. Fun, right? I did it this way to work in the party theme and to make it interactive. I won't be sharing the file for this one (sorry, I hope to possibly sell it eventually!) 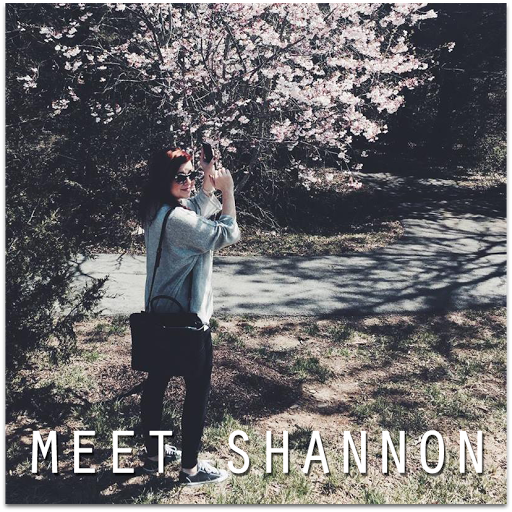 But I will share how I made it in case you want to do something similar. 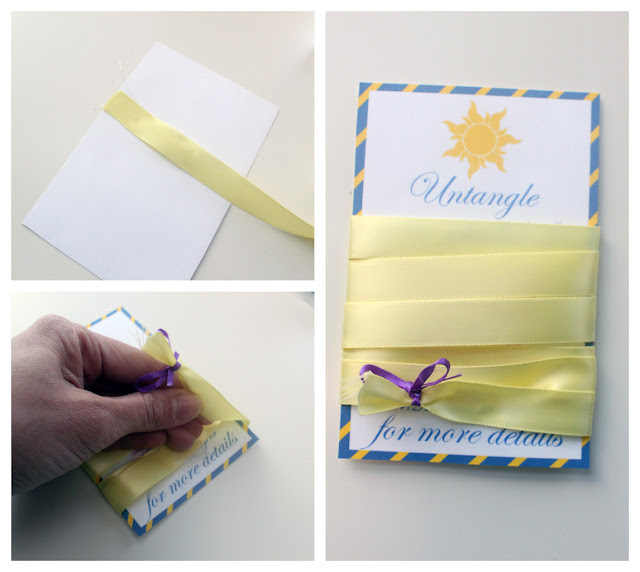 Use double sided tape to tape the end of some ribbon to the back of the card. Proceed to wrap the ribbon around the card, hiding the details of the party so that only the wording "Untangle for more details" is visible. 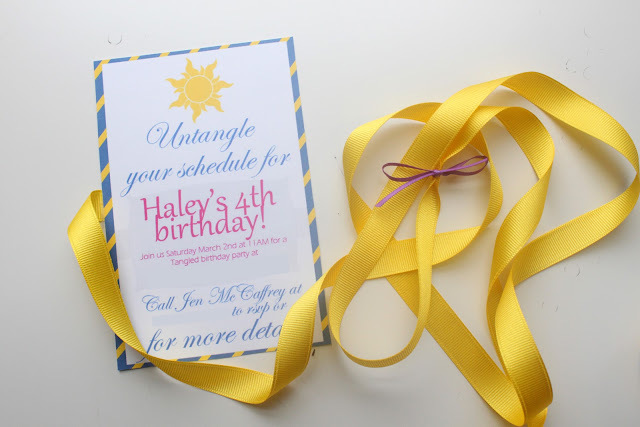 Tape the other end of the ribbon down with more double sided tape and tie with skinny purple ribbon. That's it! Pretty simple really, but so fun and whimsical. 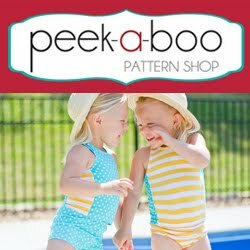 You may have noticed that the colors of ribbon in the main picture and tutorial are different shades. Initially, I wasn't able to find the perfect shade of golden yellow that I was looking for. Then (after I had already made and distributed all of the cards!) I found the perfect golden grosgrain ribbon at Hobby Lobby. Sigh. Oh well, I still think they turned out great and I think I'm the only one that cared about the ribbon color.